The only other flight from Vienna to Ukraine that afternoon was a Ukrainian Airlines flight to Kiev. The Austrian Airlines desk couldn’t help me buy it: no agreement with Ukrainian Airlines. Trying to buy it online, my American credit card seized up – unhappy with the unfamiliar Ukrainian website – then my Australian one did, too. I skype-called banks in both countries, to no avail; by which point the website was listing the flight as sold out anyway. I hunted down the tiny Ukrainian Airlines desk at another terminal; the man at the counter could wrangle the flight, but was worried about attaching my checked bag – submerged somewhere deep in the bowels of the air travel system, who knew where – to the new ticket purchase: “Different baggage system.” No surprises, then, when I found the baggage carousel in Kiev revolving and empty. The woman at the Lost and Found desk said she could find no record of my suitcase in her system (“your baggage ticket says Lviv, you are in Kiev,” she kept repeating, helpfully). Mourning some favourite clothing items would have to wait: in the first instance, I had no computer charger and no winter coat, and I still had to get to Lviv. I perked up for a moment when the woman at the airport’s only food outlet asked if I wanted my sandwich hot – a toasted sandwich, just the thing! – before she put it (still wrapped in its plastic sheath) in the microwave. Lviv is about 550 kilometres to the west of Kiev. The overnight sleeper train was to leave at 10.47pm, and arrive at 5am. The train station is open to the night air and I am conspicuous – and suffering – in my flimsy cardigan. Boarding the train, I see there are two beds per compartment; moving through the corridors looking for my cabin number, I swallow a little prayer that the other bed in mine is empty, or at least assigned to a woman. Instead, it is a Ukrainian soldier in khaki. He’s probably only in his mid 40s, but looks significantly older. I give a faint, evaporating smile and bury my head as quickly as possible in a book. Expressionless, he attempts something of a conversation, but with no shared vocabulary, the only bit I understand of his frustrated mime is when he gestures first to himself (hand on chest), then far away (hand flapping over the horizon), and then imitates shooting a machine gun. Yes, I understand you kill people – thank you so much for underlining the point. We turn the lights out. I lie on top of my possessions, and am grateful that the provided blankets offer a layer of mediation. But they become increasingly oppressive as the heat rises to sauna-like density (I spied a thermometer in the corridor as I disembarked which said 33 degrees celsius, but it felt even hotter in the tiny airless compartment). I sweat and sweat, but leave the blankets on. And I arrive in Lviv, pre-dawn, in time to give my paper, though on the back of two sleepless nights. The Kiev I saw out the bus window between the airport and the train station was unfamiliar and palpably Soviet: monumental apartment conglomerates with curling, blue-lit tops, like a brutalist, neon reinterpretation of an orthodox steeple. Which only sharpened the surreal experience of arriving in Lviv – a new city that was already, somehow, known. It is an Austro-Hungarian city – Lemberg, the capital of Austrian Galicia. I knew that, abstractly, but was unprepared for the physical sensation of it – the sense of intuiting how it worked and how the spaces connected, the familiarity not only of the buildings but of the way they spoke to each other, the (correct) suspicion that there was probably an opera house around up that curling boulevard. It is a mini-Vienna, and breathtakingly beautiful. Dense, ornate, unhurried. We know from books like Pieter Judson’s The Habsburg Empire that municipal expansion exploded at the same time and in the same, neo-historicist styles across the Habsburg lands; though what that means experientially as a traveller, a hundred years after the empire’s collapse, floored me. The city’s built environment, perfectly preserved, stores up the lived empire like a sponge. The placeiness of the city and its (dis)location in history lies at the heart of the weekend’s program of events inspired by Philippe Sands’ East West Street. The buildings stand undisturbed (a seamless, almost deceitful continuity), but the people who lived in them in the early twentieth century – Poles, Jews – are long gone. The current Ukrainian inhabitants are comparative newcomers to the city (mostly from the surrounding countryside); most say they have never been told about all that happened here in the cataclysmic violence of the mid-twentieth century. Sands has joined forces with a number of local scholars, and, together, they are trying to coax the city to speak again, to talk about who lived here and what happened to them. 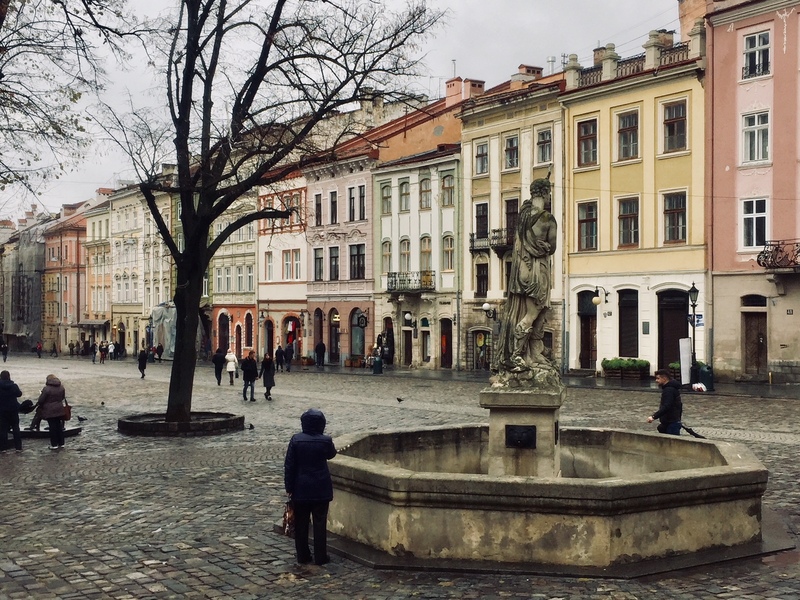 The Lviv Center for Urban History has compiled a thoughtful, multidimensional program, mixing scholarship, public history, and what we might call memory activism. Some of the most interesting presentations were given by local scholars and community organizers in the packed town hall events on Friday evening, where we all sat huddled with our little black headsets transmitting simultaneous translations. They spoke of bringing those memories home into the city, and the traumatised pasts that pile up in layers. Could Lviv claim its cosmopolitan heritage and somehow re-digest that violence at the same time? Sands is relaxed, charismatic, and energetic, flattering our hosts in his recurring declarations of love for the city. He carefully repeats that all societies have these repressed pasts – “I live in London, and we have no museum to colonialism or slavery” – to mitigate the impression of the west again telling the east how to behave, and what to feel, and scolding its backwardness. His east west street is a different one. He is most excited about the plaques to be unveiled on the erstwhile homes of international legal titans Hersch Lauterpacht, Raphael Lemkin, and Louis Sohn, writing their lives back into Lviv’s streets. On Saturday we traipse across the city from house to house, a large, ungainly caravan of scholars, lawyers, family members, local dignitaries, media, and curious onlookers. The Lauterpacht family home is in the middle of town, a four-story building at 6 Teatralna Street, not far from the opera house. It is our first port of call and the largest event. It is raining lightly, which emphasizes the both melancholy and the faint, clumsy comedy of it all, as umbrellas poke eyes and block the view. Speeches are given: Sands; the city’s mayor; the marvellous Sofia Dyak (of the Center for Urban History); Lauterpacht’s granddaughter. Sands gives television interviews into bulging red microphones with an easy grace, always able to access the right sort and degree of earnestness. The beaming, rosy-cheeked mayor says he is glad: Sands is putting so much energy into things he fears he should have been doing. (Subsequently, I hear of battles with this same mayor over building projects atop two Jewish cemeteries destroyed by the Germans). To reach Lemkin’s address we walk quite a distance to the north. We pass under a railway bridge: after he left the city, this would become the entrance to the Jewish ghetto. His house lies in the block beyond it (21 Zamarstynivska Street), though he only lived here for a year while a student. The sun comes out briefly as we cycle through another round of speeches and interviews. Then back into town to Sohn’s house at 18 Akad. Hnatiuka Street, close to the university, where his plaque now faces one on the opposite side of the road marking the birthplace of another famous former resident, Ludwig von Mises. “Placeless/Placeness” ran the title of the academic part of proceedings. “What is it about this place?,” asked Sands at one point, reveling in the drama. How could all these ideas be rooted here? The assembled legal scholars give small headshakes and demur; there is a deference to something almost mystical, or at least inexplicable. Where to begin? It is clear, for one, that the reasons why law was so important in the public life of the Habsburg Empire are little known in this conversation: that there is scant understanding of how the non-congruency of empire, state, and nation produced such frenetic legal creativity in so many directions; of the longstanding imperial-constitutional debates about the rights of individuals as against the rights of (ethnic) groups; of the fact that one could tell a parallel story about many of the law schools, even those (like Lviv) situated along the empire’s “peripheries.” Places like Czernowitz (now Chernivtsi), for example – a field-shaping powerhouse in other domains of juridical thought. (For the record, I am not pitching Habsburg history as the only context; but it is, I think, a necessary one). For Sands and co, history adds pathos, texture, and drama; it steeps law in the unfamiliarity of the past and grants it an otherworldly magic, so suited to the poignancy of Sands’ narrative. But it is not a mode of reasoning: it seemed almost surprising that it might be used to explain things (however imperfectly) – to do analytical rather than aesthetic work. 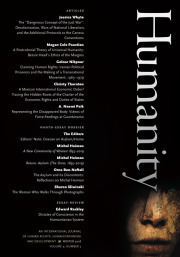 His history of international law remains inside the history of international law – context is personal, not structural. Ironically there is so much more work to do to bring it back to places like this, to undo its own pretention to placelessness. What might it mean to write the history of international law from East Central Europe? In many ways, the question has not yet even been posed in earnest. Natasha Wheatley, an assistant professor in the Department of History at Princeton University, is writing a book about sovereignty in Central Europe. Her article, “Spectral Legal Personality in Interwar International Law: On New Ways of Not Being a State” appeared this year in Law and History Review. Many thanks Natasha (and Samuel Moyn for posting link). Interesting to put your account of this event alongside Sarah Nouwen’s on EJIL Talk! Sands’ project is surely important, yet limited in various ways including the ways you indicate. In some ways very troubling I think. I was in Kyiv in May for an ESIL conference that was a kind of prequel to the Lviv. All best, John R Morss of Deakin Uni Law School nr Melbourne Oz. Приветствую! At the same time, we cannot ignore the unprecedented escalation of organized violence against Roma living in spontaneous settlements. In fact, during the two full months of 2018, from the end of April till the end of June, six attacks on temporary Roma settlements took place in Ukraine. Centers of gravity of these attacks were big cities such as Kyiv, Lviv, Odessa, where the Roma come to get a seasonal work.